He gets encouraged for the work he did at school. 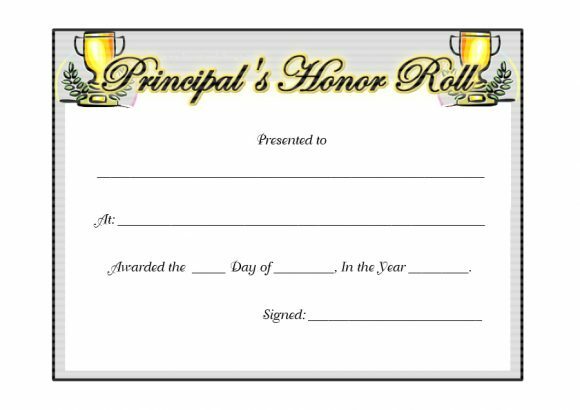 Making an honor roll certificate template is easy and it’s very rewarding. In most schools, teachers are aware of such students who excel in their academics. 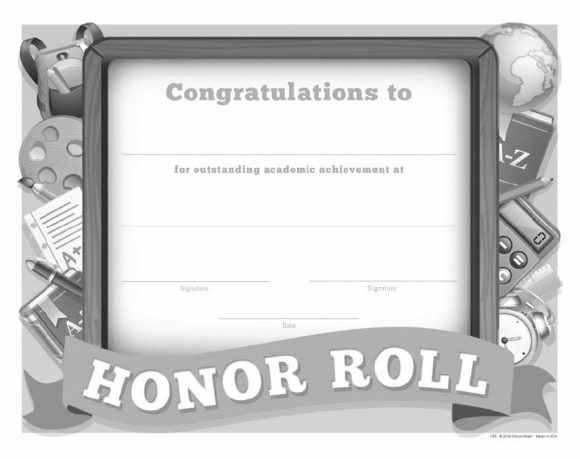 It’s a way to recognize their efforts in their academic studies. They are also rewarded for participating in extra-curricular activities. 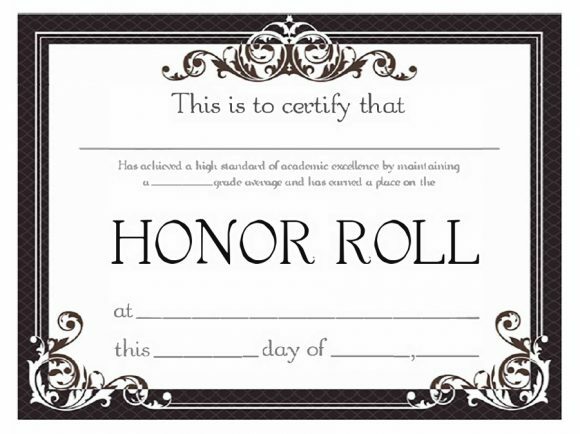 To a student it a token of appreciation for trying their best, you can give these certificates. 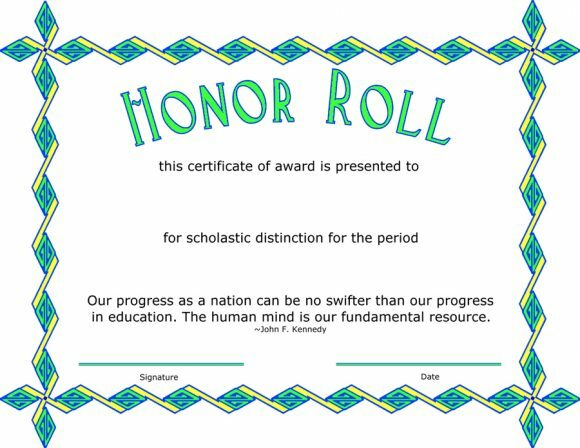 Make sure you think about the honor roll certificate wordings carefully. It will help to convey your message well. 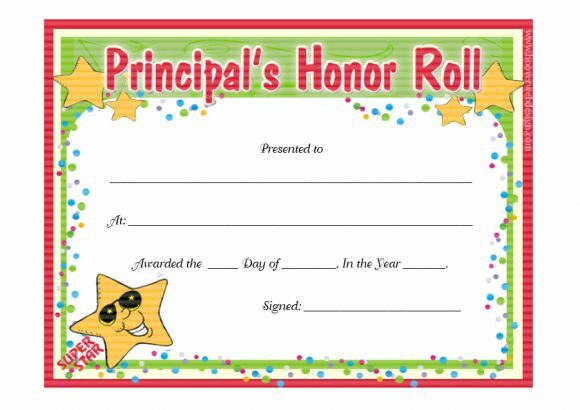 Both students and parent appreciate such certificates. It makes a student happy and it makes his/her parents proud of the achievement. 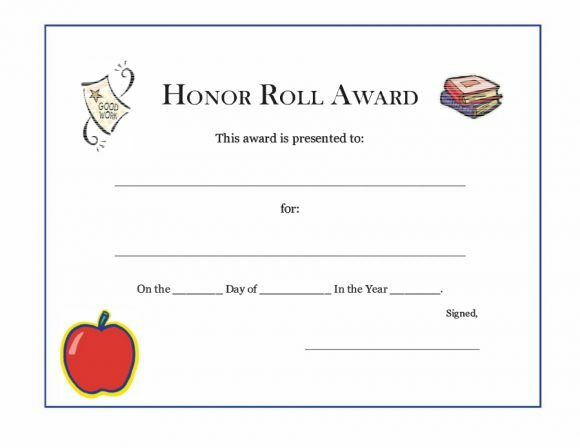 Nowadays, teachers and schools give different kinds of awards to children. But none of them make as much of an impact as a certificate. Such a document is a better reward since the student can frame it. 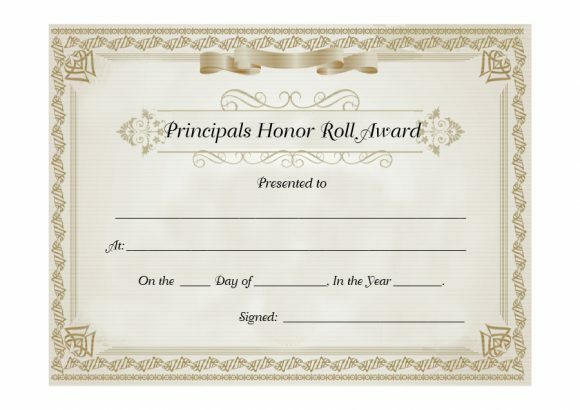 He can keep it as a keepsake for his/her excellent work at school. 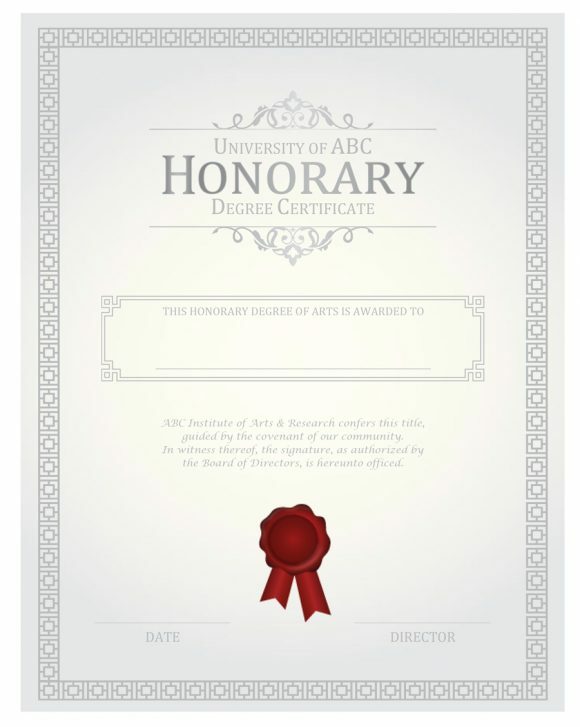 In this article, you’ll learn all about this kind of certificate. 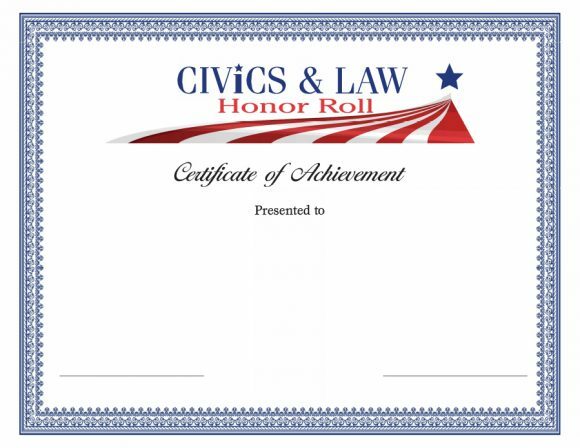 An honor roll certificate is a great tool of recognition. 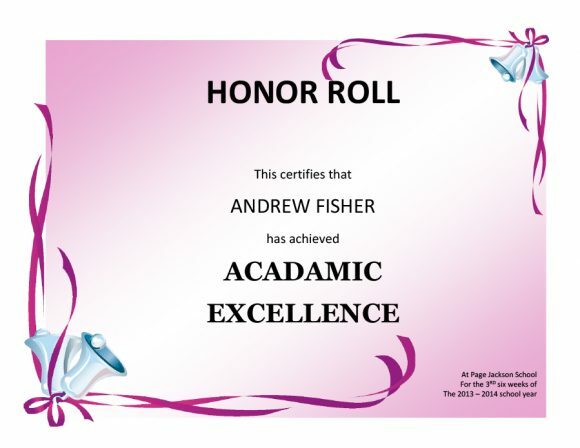 It helps in appreciating the academic achievements. 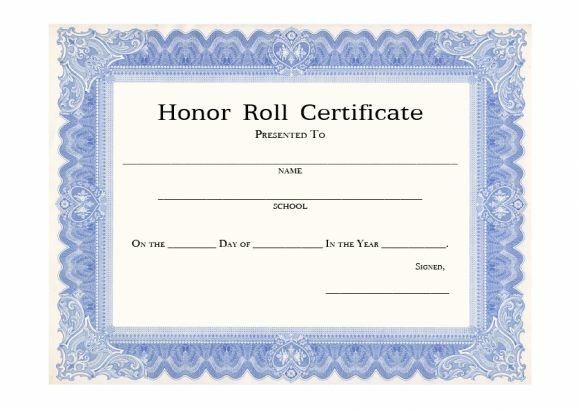 As a teacher, you don’t have to give such certificates to all your students. 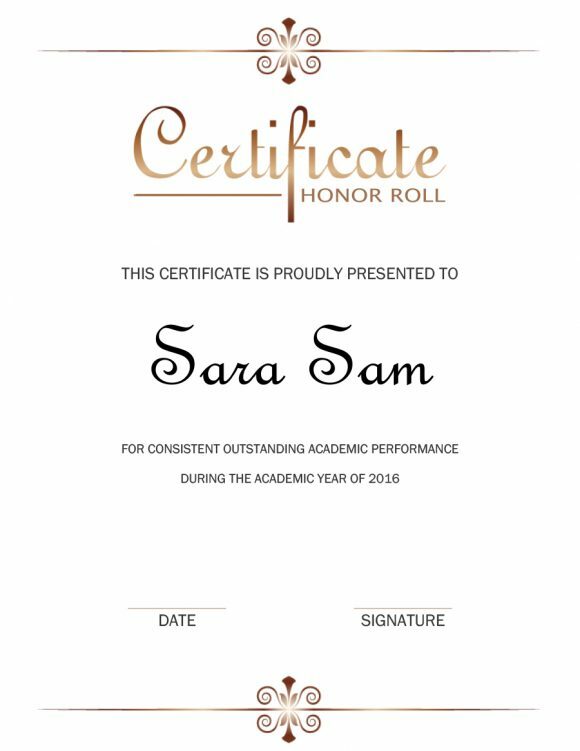 On performing well, better than all the other students, students get academic honors. This may be a means for them to acquire a good scholarship in their next level of studies. 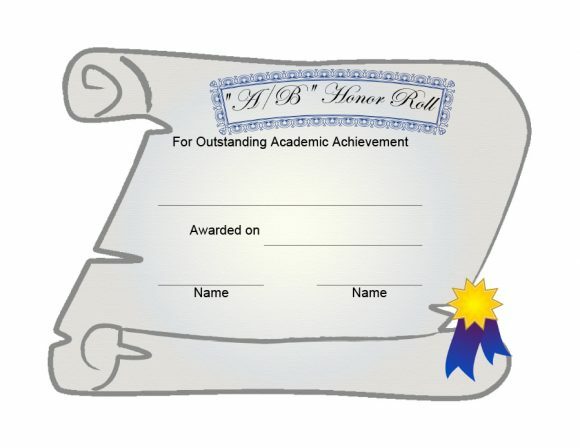 Usually, this type of award goes to undergraduate students. 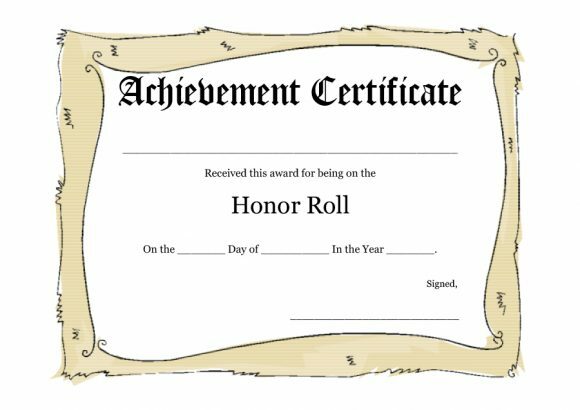 In some universities, they give certificates with this award. 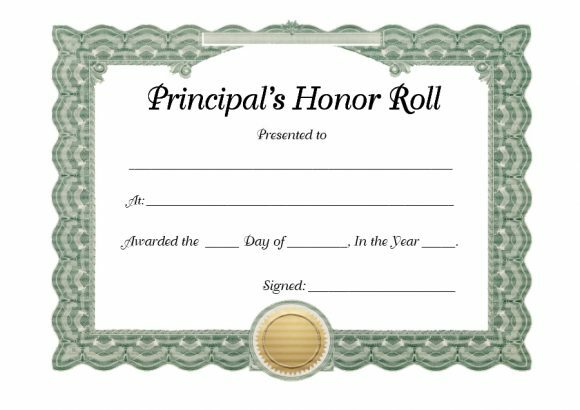 Once a year, students receive these types of awards based on their performance. If a student performed above and beyond what’s expected, then he may receive such an award. In universities, students may also get on the Dean’s list. 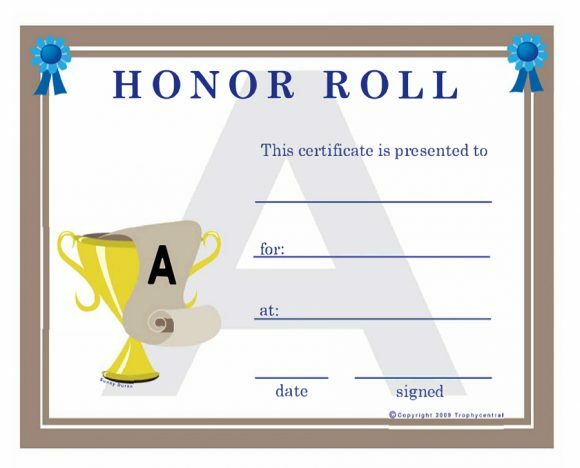 A student would be able to get on this list if he/she earns the grade needed. 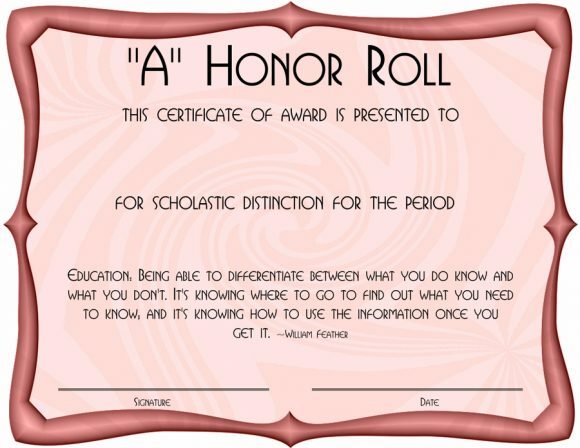 Unlike academic distinction, there are 3 kinds of this honor. 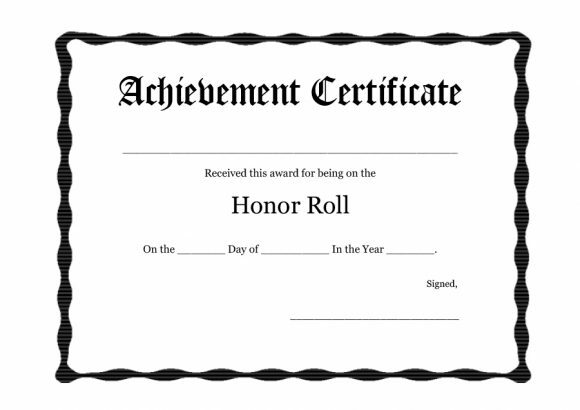 Students who get this type of awards get recognized by their college university. 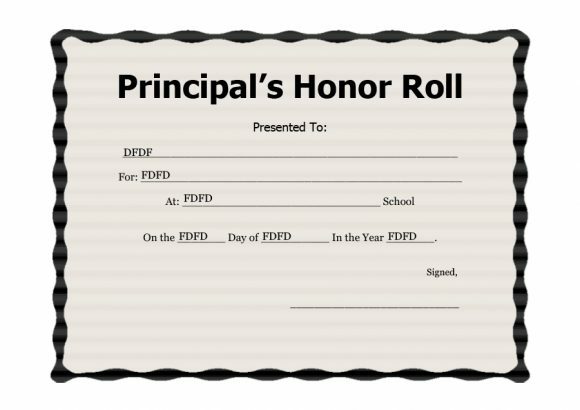 The recognition then goes into the student’s permanent record. Also, it appears on his/her official transcript. Similar honors given by the different departments and colleges. 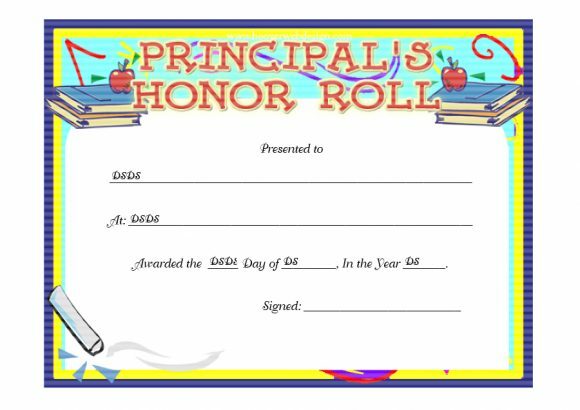 There are also discipline-based awards which a student receives for behaving well. A lot of schools give away tokens to reward the students who perform better than others. But usually, these tokens end up gathering dust in their homes. So, it doesn’t seem to be the best way to recognize the efforts of students to perform above expectations. 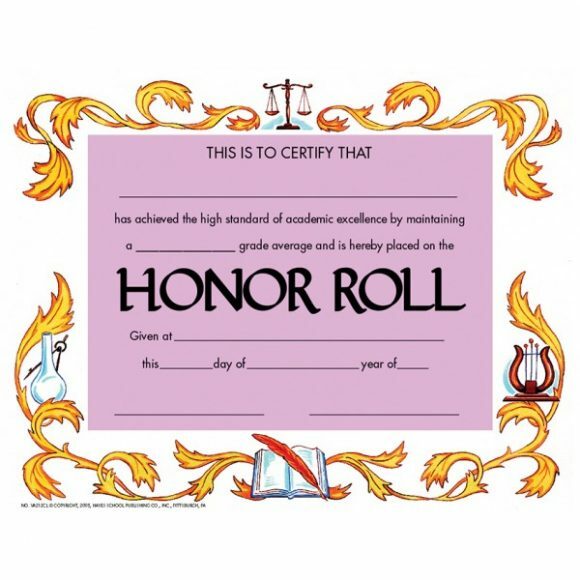 Keep in mind that students put in more effort to be on the honor roll. 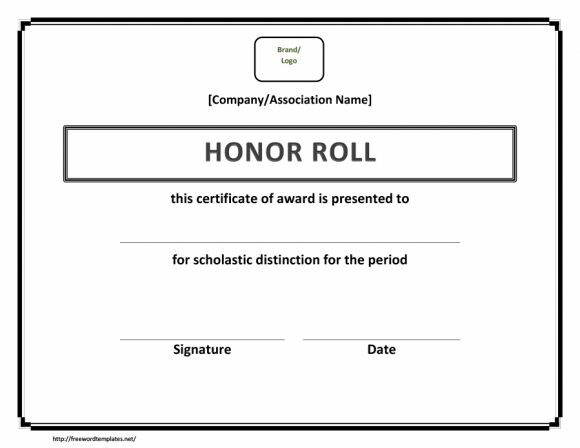 The least you can do as a teacher is to prepare a well-worded honor roll certificate template. If you design it well, the certificate can look like an official document. In fact, if the certificate comes from the school, it actually is an official credential. 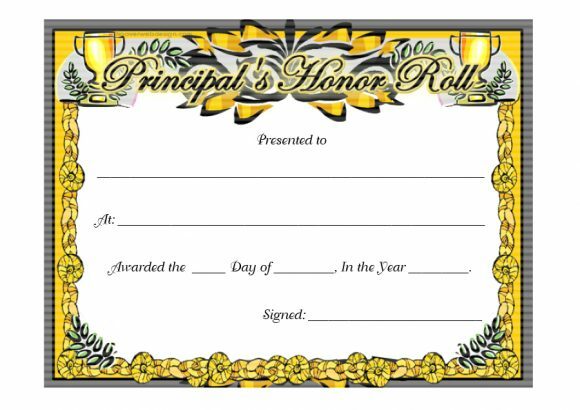 Teachers can put to make the certificate look professional or fun. It depends on the students’ level. 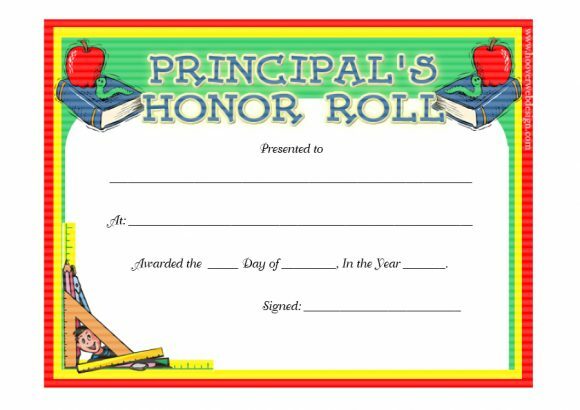 Then the student may have his/her certificate framed and displayed in his/her home for everyone to see. Another benefit of giving such certificates is that students love receiving them. It’s a great way to motivate your students and keep them enthusiastic. They do not give up on trying their best in school. This is especially true if you’re a teacher of younger kids. Such kids love getting recognized and awarded. On giving such awards in the right manner and time, it establishes the motivation among them. Over time, they won’t even need to get these awards to try their best at school. They would be intrinsically motivated, which is a lot better in the long run. 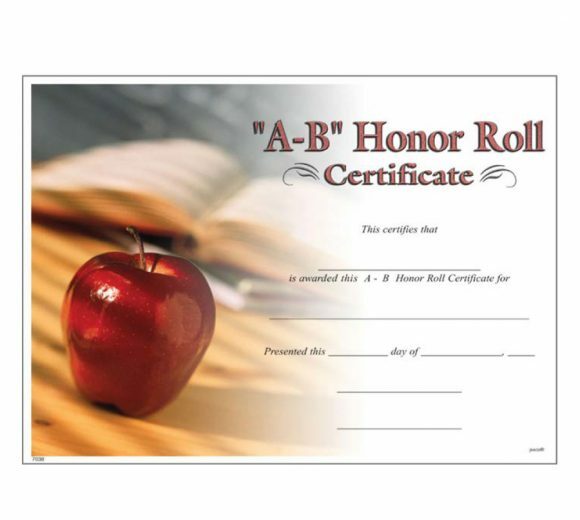 Depending on your student’s level, he/she may be able to use the certificate. Also, you can give it for different purposes. 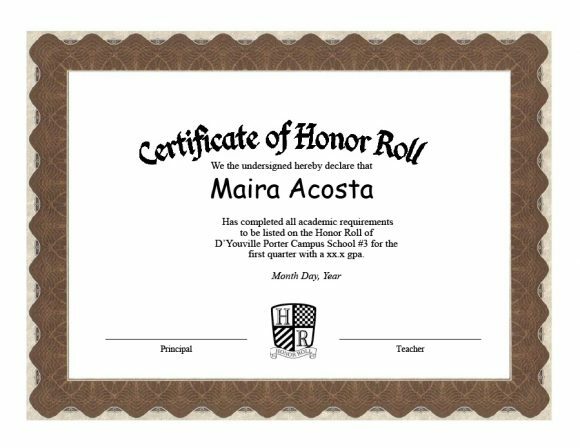 A student may use an honor roll certificate of high school while applying for college. This is beneficial since it might help the student get into the school he’s hoping for. 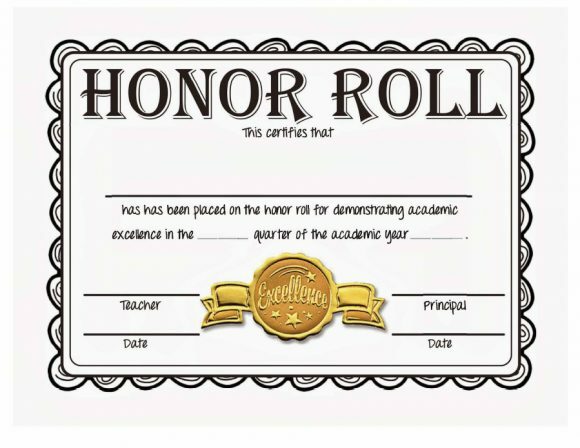 These are some of the best benefits of giving such awards to students in the honor roll. When it comes to creating awards like this, there’s no standard way of doing them. There is no set format for the younger students. When you make a template, think about who you’re making it for. 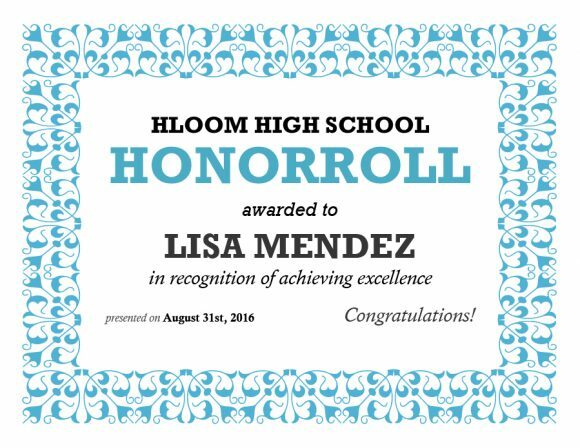 Think about the honor roll certificate wording carefully as well as the design. 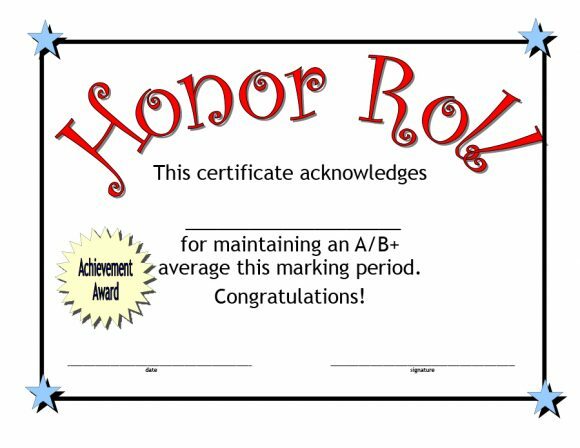 This way, your students will surely appreciate the certificate when you award it to them. 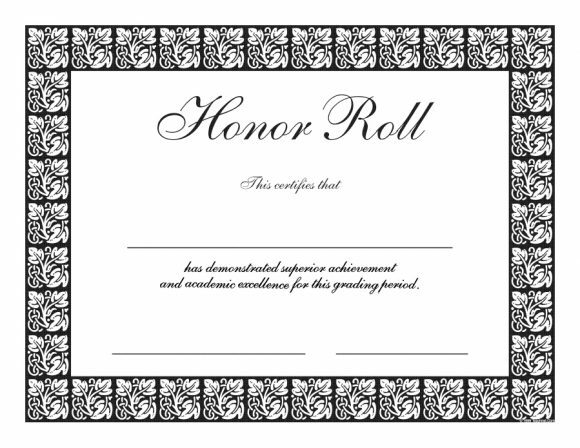 If you’re a student and you’d like to get on the honor roll, you have to put in the effort. 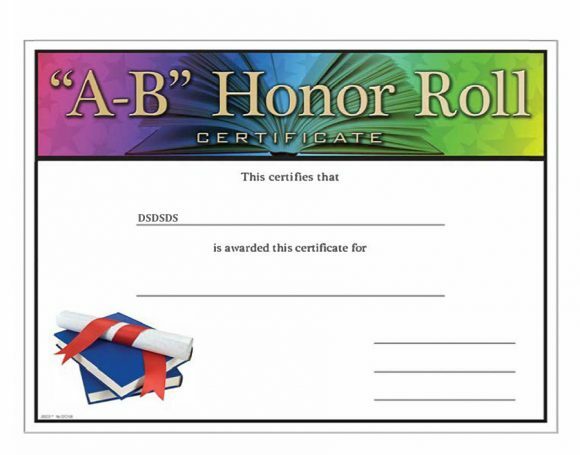 Getting an AB honor roll certificate or any kind of certificate is achievable. Having such credential looks great while applying for college, universities, and employment. 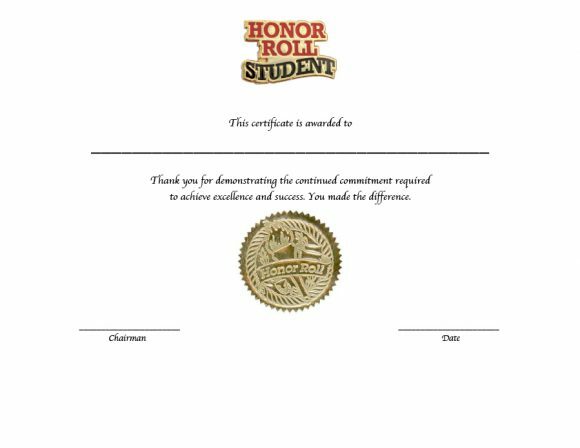 So, if you’re interested in acquiring an honor roll certificate template for yourself. Here are some tips to guide you. 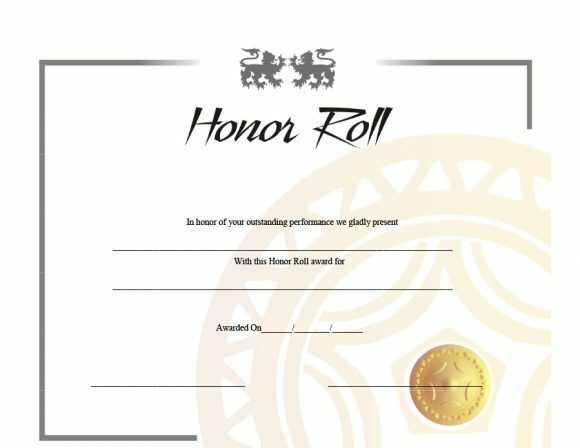 This is the very first thing you need to do to get on the path to being part of the honor roll. Ask your teachers about the requirements you need. You have to know what GPA you need to get and if there are any other qualifications to meet. Also, find out if joining any extra-curricular activities will help your cause. Aside from your teachers, you may also speak to your guidance counselor. 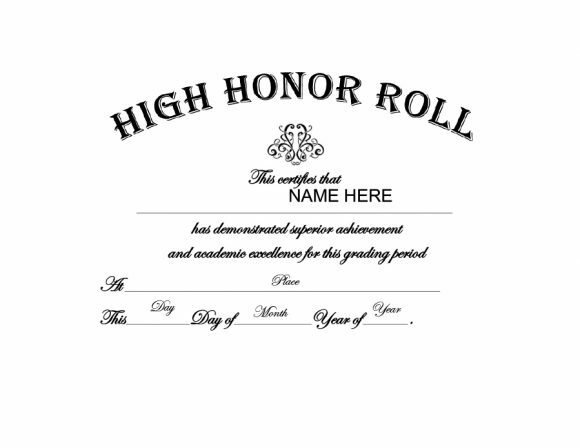 Ask if there are any behavioral requirements associated with the honor roll. Think about your skill level and plan out your courses accordingly. Some courses may have a bigger impact on calculations of your GPA. Ask yourself you’re confident about taking these courses. Also, when you know that taking them will help you reach your goal, go right ahead! In all of your classes, make sure you meet the grade requirements. Don’t just aim for the major classes; try your best in all of them. That way, all your grades will add up and you’ll have a better chance of reaching the required overall GPA. Take note of all the upcoming assessments so you can study for them. Usually, such assessments and assignments play a huge part in your final grade so try to do your best. When you know that you have a test, a quiz or such the next day, make sure you’re well-rested so you can perform well. Keep track of your most current grades. In doing this, you’ll be able to focus more areas or subjects you’re not doing very well on. Of course, you should leave the other subjects behind. When you’re studying, set aside more time for the subjects you’re struggling in. But also study for those you’re doing well on. It’s also a good idea to keep an open communication with your teachers. 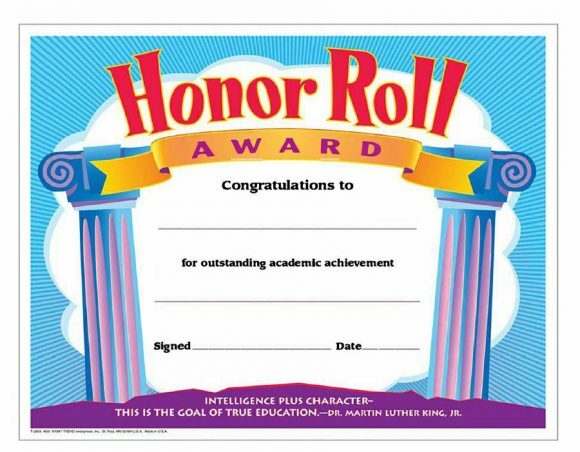 Don’t just ask them about getting on the honor roll at the beginning then stop talking to them after. In order to do well in class, you have to learn how to communicate with your teachers. So, if you have questions or clarifications, it would be easy to approach them. Once you know what you need to do, the next step is to apply yourself. When you’re in class, pay attention to your teachers. This is important so you understand the lessons. And if anything is unclear, don’t be afraid to ask questions. 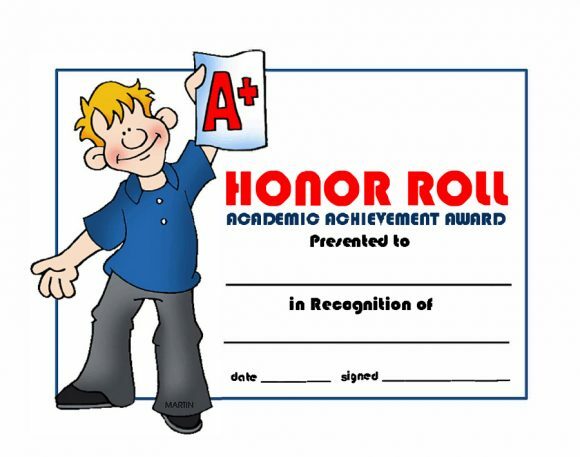 If you don’t pay close attention in class, then you might not be able to reach the honor roll. This is so because you’ve missed some of the lessons. 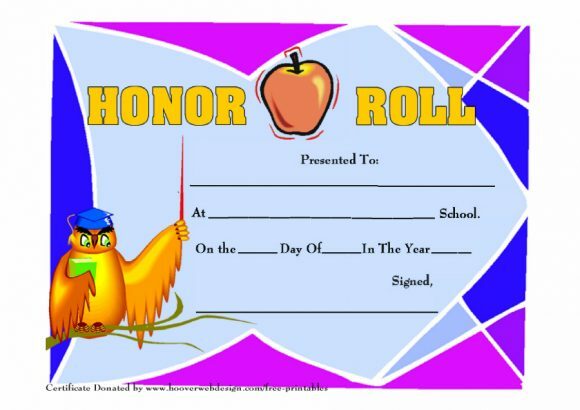 Then you can say goodbye to the honor roll certificate you were hoping to get by the end of the year. Accomplish your homework consistently. No matter what kind of homework it is and no matter where you are set aside some time to accomplish your homework. Even a single assignment may affect your grades so try not to miss any. Teachers give out homework to reinforce your learning in class so make sure to do them. Also, it’s never a good idea to leave homework until the last minute. When you do this, you’re likely to do a poor job. This will then reduce your chances of getting on the honor roll. While thinking of wording, she will write about the assignments. Always turn in assignments which you’ve thought about well. Also, include those which you’re confident in submitting. It’s a good practice to proofread your work before handing it in. 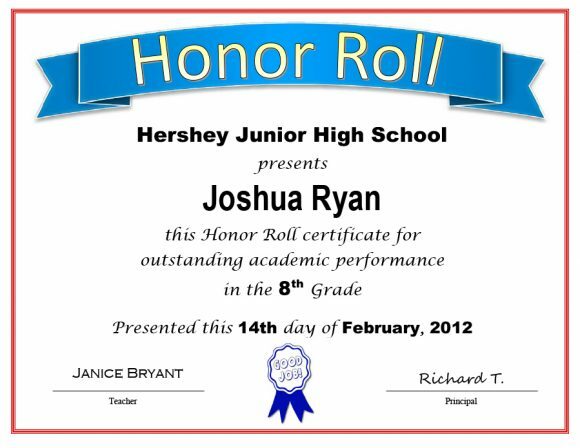 Finally, in order to get on the honor roll, you should try and go the extra mile. 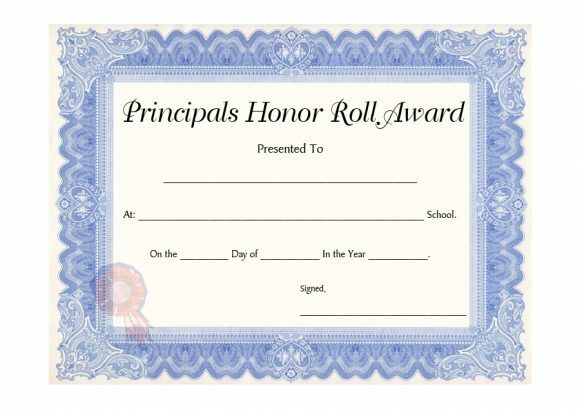 Remember, only students who perform above and beyond receive such awards. So if you want to be one of those students, you need to put in the effort. If you need to, don’t hesitate to ask for help. Talk to your teachers about subjects or concepts you’re struggling with. Teachers are there to help you out so go ahead and approach them after class if you need to. This shows that you care about your grades and you’re willing to go the extra mile in order to maintain them. If you’re doing work at home and you’re struggling, try asking help from your parents. Or you can even call one of your classmates. Ask him/her about the part of the assignment you’re having trouble with. When you know that your exams are coming up, don’t leave studying to the last minute. Set some time each day to study the concepts bit by bit. This makes it a lot easier to understand the concepts and remember them when it’s already time for the exam. When you’re in class, take notes well. Make sure your notes are easy to read and they contain all the important information. If you write down messy and illegible notes, they would be quite useless. 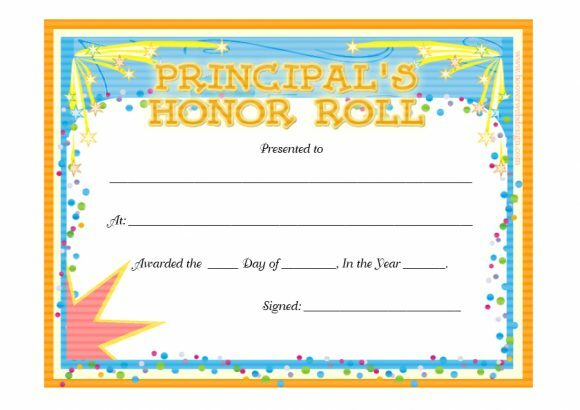 If you really want to be on the honor roll, be sure to organize your notes and make them clear. 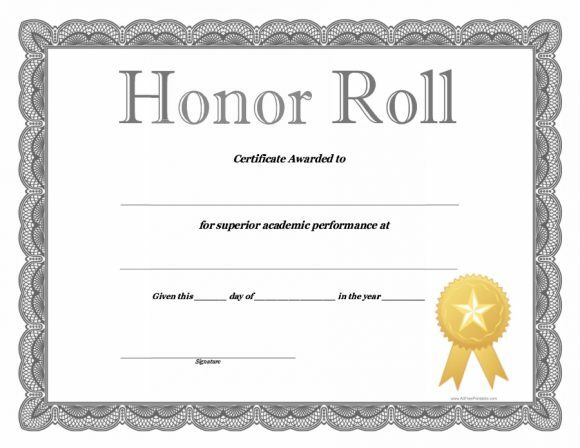 You can increase the chance of getting on the honor roll. You can do so by joining extra-curricular activities. When you do this, it shows that you care about your grades but also about other things. Joining such activities will make you better-rounded. Finally, don’t stress yourself out! 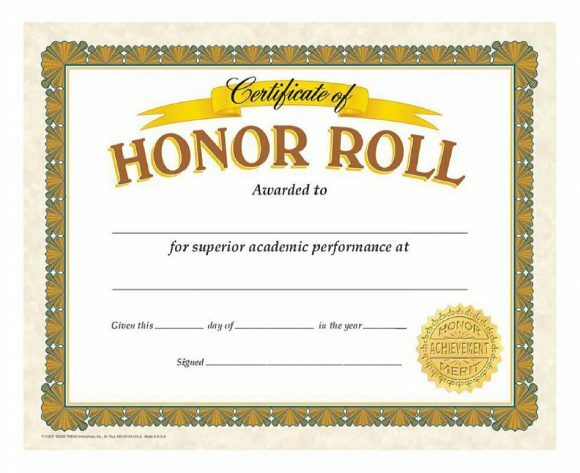 Doing so, your chances of getting the honor roll reduces. You need to find the right balance between school and your personal life. Take a break from studying and you’ll be able to focus more and perform better at school. Follow these guidelines. 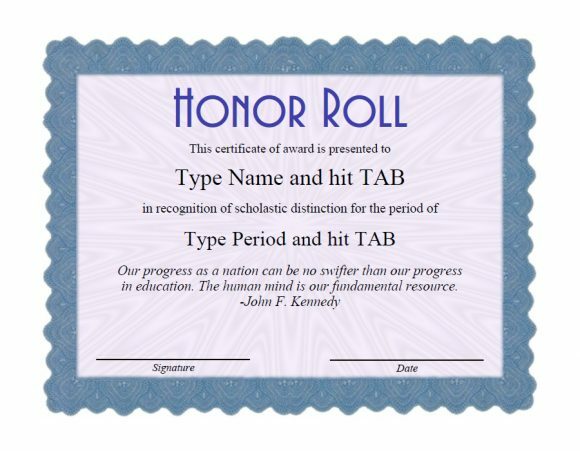 Soon, the honor roll certificate template your teacher made would be for you! As long as you try your best and you put in extra effort, you’ll see that everything pays off in the end.